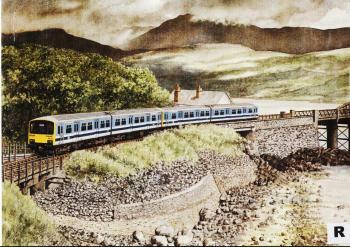 Racing down the track, hopefully to a golden future, a Sprinter diesel makes for Barmouth on the scenic Cambrian Coast line. The Sprinters are the first real shot in the arm BR's provincial lines have had for a quarter of a century. They are the new generation of diesel trains for cross-country and urban local passenger services which will eventually replace the ageing fleet of diesel multiple units, now all over 20 years old and well past their prime. Sprinters aim to bring the same standard of comfort taken for granted by InterCity passengers to travellers away from the mainline. Fast - with a top speed of 75mph - they are also real smooth runners with secondary air suspension which means they ride like the InterCity carriages on whose design they are based. Each 2-car Sprinter has passenger-operated sliding doors, public address equipment, double-glazing and a toilet. Their rapid acceleration makes faster overall journey times possible, and they incorporate the latest diesel engine as well as power systems which cut maintenance costs by one-third, improve operating efficiency and reduce fuel consumption. The Sprinters - and their lightweight, bus-bodied companions the Pacers - are the sharp end of a host of current Provincial Sector improvements which include station refurbishment, track rationalisation and new computer-controlled radio signalling. With over half BR's route mileage and two-thirds of its stations, Provincial operates passenger trains everywhere outside the InterCity and Network SouthEast fiefdoms. It is, inter alia, responsible for virtually all the most scenic routes in Britain and has recently launched a major promotion to attract more customers to see the beauties visible through a carriage window. The Cambrian Coast line, which actually starts back at Shrewsbury and runs to Machynlleth, Barmouth and Pwllheli as well as to Aberystwyth, is a perfect example of the past and present of such routes. Uncertainty about its future led to neglect and a lack of investment in the 1970s, and for a time its run-down services and seedy stations typified what the then Chairman called BR's "crumbling edge of quality". Over the past couple of years, however, a £4.7million package of improvements has transformed the line into the most modern rural railway in Britain. Indeed it has literally been rescued from the death of 'jaws' - the teredo norvegica or marine shipworm - which was relentlessly devouring the weathered old timbers of the Barmouth Bridge. Such was the damage inflicted by this voracious creature that for a while locomotive-hauled trains were not allowed across the weakened structure, putting the whole line in jeopardy. Five years work and £1.5million has put paid to the hungry little chaps and in 1986 through services once again ran between London, Birmingham and Aberystwyth including a revival of the line's one time crack train "The Cambrian Coast Express". Long may it flourish.